Afternoon tea is one of my absolute favourite things. For me, there are few activities that are as indulgent, sociable and relaxing as this very British institution; whether it be a tea party in the house, sitting in a friend’s garden, visiting a café or tea rooms or upping the anti at a luxury hotel such as The Alverton, the only 4 star hotel in Truro. When I was a child, we lived for a few months with a friend of my mother’s who was renowned for her elaborate high teas, which she made for us all every weekend. There were sandwiches, cakes, tarts and the piece de resistance, Yorkshire puddings served with jam and clotted cream – no scones for Glenys. She later opened a very popular tea shop on Dartmoor, which I so wish was still in existence. I’m sure it was her teas that set me up for my love of baking. It wasn’t until my early 20s that I had my first afternoon tea at an exclusive London hotel – The Ritz, no less – where I’d gone with friends to celebrate my birthday. It’s hard to express how excited I was at the prospect. Later a group of us celebrated our graduation with afternoon tea at The Grosvenor, which was even more sumptuous than the Ritz. Afternoon tea has never ceased to be a real treat and something to look forward to. Luckily, afternoon tea has become increasingly popular outside London and it’s now easier to find hotels and other venues that put on a good spread. In honour of National Cream Tea Day, last week, I was invited for the Ultimate Afternoon Tea at The Alverton. The Alverton is a beautiful old manor built in 1830. It became a convent in 1876 with a large chapel added for the purpose. In 1984, the manor became too big for the dwindling number of nuns and it was converted into a hotel. The building is grade II listed and boasts sandstone walls, mullioned windows and a Cornish Delebole slate roof. It also has an extensive garden with some impressive specimens, as CT was pleased to point out. The day we visited was a pleasantly warm and sunny one, so we chose to sit outside on the terrace, although the table that had already been laid for us looked rather inviting with its crisp white napkins and window aspect. We sat under the parasol enjoying the views of the garden and chapel whilst we studied the tea menu. The teas are all Cornish ones from the nearby Tregothnan estate, which I thought a particularly apt touch. We both ended up ordering manuka tea, which is not only refreshing, but has a distinctive fragrance which took us both back to our time in New Zealand. I was quite entranced with the accompanying tea timer, which allowed us to enjoy the perfect brew. I’d already notified the hotel that I was a vegetarian, but was rather concerned that this might have been overlooked. I needn’t have worried; when the sandwiches arrived, there were the set ones for CT and a separate plate for me. The finger sandwiches were neat, with the crusts cut off, of course. My fillings were: cream cheese and cucumber, egg mayonnaise and cheese with homemade pickle – all rather tasty. The sandwiches did not arrive on their own. We had a veritable tower of goodies, with a selection of elegant patisserie as well as homemade scones, jam and Cornish clotted cream – it was National Cream Tea Day after all. I thought the clotted cream shaped into quenelles was particularly well done and made a nice change from the usual pot. We enjoyed the cream tea part, but the cakes were truly delectable. As we didn’t want to ruin our afternoon with an unseemly squabble over who should have what, we halved the cakes so we could try them all. Luckily there were two pistachio and orange macarons so we had a whole one each. We really enjoyed the raspberry millefeuille, profiterole and chocolate brownie stack, but surprisingly we both thought the less showy pistachio and olive oil cake was the best of the lot. We were told that the chef particularly enjoyed making his patisserie and it showed. We sipped our tea, savoured our cakes and thought “this is the life”. The staff were very attentive, coming out regularly to check on our welfare and whether we needed a top up for our brew, which we did – twice. It was a relaxing and very enjoyable afternoon and I have a sneaking suspicion we will be back. I did think, as it was the strawberry season and we grow some most delicious strawberries in Cornwall, that there might have been one or two accompanying the scones, but that’s a minor quibble. Tea is served from 3-5pm seven days a week. At £15, the full afternoon tea is reasonably priced. A glass of prosecco or champagne can be added for an additional £5.50 or £10.50 respectively. Thanks to The Alverton for inviting me to partake of afternoon tea. I was not required to write a positive review and as always, all opinions are my own. sounds wonderful – I am just a bit envious! I love Afternoon Tea – its such a treat! It looks lovely and those scones – wow! oh yes, afternoon tea at every stop on a British holiday!… my favourite pastime! A gorgeous review and look at all that stunning clotted cream! Clotted cream Dom? Now you’re talking. They were very generous with it, which is not always the case at some cream tea stops we’ve tried. What a beautiful setting for an afternoon tea. I love those timers too, we have those at our local cafe. It is a lovely setting Dannii. I’d never seen those timers before and was very impressed. It’s not something I’ve ever asked about, but I’m rather surprised in this day and age that there aren’t a few places that cater for it. There is the Waymarker, but it’s not exactly close. I’ll let you know if I come across anywhere else. Oh no, that’s no fun at all. I’m really surprised. I certainly see gluten free cake in most places I go to. You need to start making a fuss, the more who demand gluten free, the more there will be on offer. Cafe Fleur in Liskeard usually have gluten free cake on offer, but I’m guessing that’s a bit too close to home. Mm! I love high tea, but only ever had it out once, at the Adelphi in Liverpool many years ago when I was a student. I love making vegan versions this time of year though; scones, jam and coconut whipped cream being top of my list! What a good idea Sarojini. I still haven’t tried coconut whipped cream, but I’ve been meaning to do so for ages and really mustn’t leave it much longer. I’m goign to UK in August, hope I will have an afternoon tea! Oh do try for afternoon tea Manu – it’s so quintessentially British. How absolutely divine! Looks a beautiful setting for afternoon tea as well. Thanks Ness, it really is a lovely place for afternoon tea – tranquil with beautiful views. Lovely! I’m very jealous of the clotted cream. We never get it up here. Hope to sample some when I’m down your way in September. Oh that’s an absolute must Claire. Have you decided where you’re going to stay yet? What a lovely day out, and a proper Cornish one at that! It was a lovely afternoon Janie – so relaxing and just what was needed to revive our flagging energy. Surely, in this day and age, there is such a thing as a vegan afternoon tea Jac, even if you have to alert in advance. I love afternoon tea – it was one of the things that I craved massively when I was pregnant – I reckon I got through a bushel of scones. These look lovely – uneven looking scones with perfectly neat sandwiches. 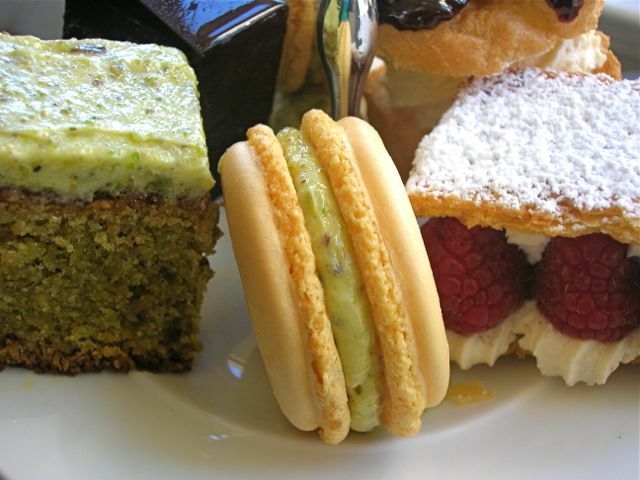 I’m a huge fan of pistachio too so I think that those cakes and macarons would put me in absolutely heaven. There is just something wonderful about afternoon tea! The Alverton looks beautiful and the food sounds perfect. Dying for a cuppa now, even though it’s hot here! Hehe. Not sure if it’s one of those urban foodie myths or not Sarah, but I understand that hot tea is meant to cool you down!?! Wow. I am so jealous. Lucky you eh. I have never heard of Jam and cream in Yorkshire puddings. However I always stuff lots of cranberry sauce in my YP’s for Roasts so I suppose their isn’t much difference really. I have never been to an afternoon tea before. I think because we are a world heritage city, it’s just too expensive! I think £15 is a really good price, and the selection you received was wonderful! Ooh cranberry sauce in YPs, what an excellent idea Stella. It sounds as though you live somewhere rather beautiful, so maybe that is some compensation for expensive cream teas. There is something really indulgent about afternoon tea that makes it particularly appealing.